salamat sa imong pagpakabana guinacot! makabasa gani ko kabahin ani, mag lagut pa jud japun ko. Acacia) is a genus of shrubs and trees belonging to the subfamily Mimosoideae of the family Fabaceae, first described in Africa by the Swedish botanist Carolus Linnaeus in 1773. The plants tend to be thorny and pod-bearing. The name derives from Î±ÎºÎ¹Ï‚ (akis) which is Greek for a sharp point, due to the thorns in the type-species Acacia nilotica ("Nile Acacia") from Egypt. Acacias are also known as thorntrees or wattles, including the yellow-fever acacia and umbrella acacias. Many stories were told about the acasia tree. The cutting of the tree was set aside after the construction of the building because the shade was their resting place. After the construction of the pre-fabricated school building in 1966, people living near the school saw sparkling lights on its branches and heard strumming of guitar. â€œIt became the home of â€˜engcantos, â€œsaid the folks. 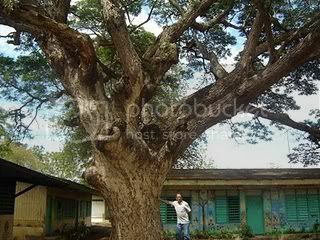 Mr. Tamiji, the school principal in 1990 commanded a child to cut the branches touching the roof. After cutting the branches, he suffered pain in his right arm. From that time on, nobody dared to cut the tree. Mrs. Abiera, a Grade II teacher was surprised why his pupils kept on looking at one of the big branch. She asked the child, â€œwhat are you looking up in the acasia tree?â€ The child answered, â€œmy classmate is still up in the tree. â€œWhereâ€¦â€¦?â€ the teacher asked. But they could not see any child. However, a certain principal planned to cut the tree. He first sought a woodcutter. But before it was cut, he asked permissions to the engcantos. He tacked an ax on the trunk and left overnight. It was found that the ax fell down. Thus, it was a bad phenomenon. The tree do not like to be cut. From that time on, the tree was left untouched even cutting the small branches. A certain David Bedico , a resident of this barangay go near to the tree and recite his â€˜oracionâ€™ asking the engcantos to heal his sick relatives. Lately this year, a certain woman removed the thick dried bark and used for firewood. Few days latter, she suffered abdominal pain and latter died. There were, many awesome stories about the acasia tree. Yet, some were untold. But now, it is regarded by the teachers as a friendly tree because it gives chilly-wide shade to the pupils to play during noontime. It never happened that it hurts anybody because broken dried branches fell down during night time. Hence, this acasia tree is a landmark and identity of Aplaya Elementary School, the biggest barrio school, the home of the oldest and biggest tree in Digos City. Wow kanindot baya ana nga acasia Sir woi..nindot kaau dana mag katkat..dunah..?